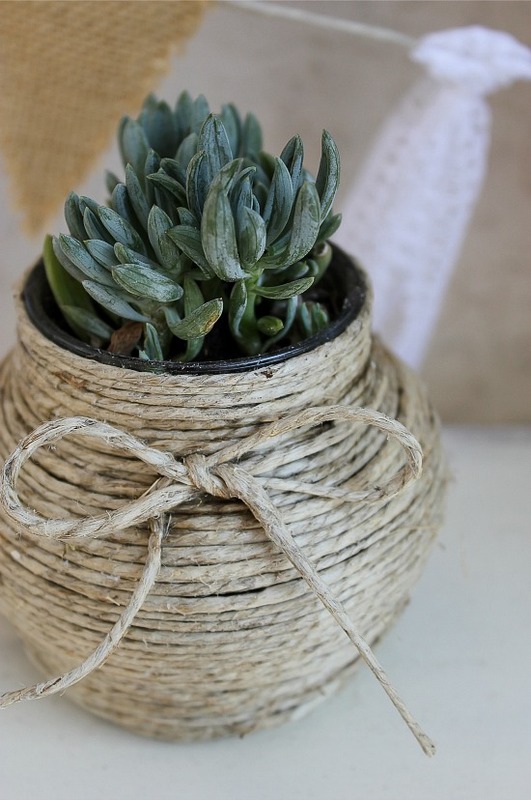 If you are looking for a simple solution to bring some greenery indoors, then succulents are the way to go. They are so easy to care for that even this gal with her black thumb has managed to keep several alive for a couple of years now. It also helps that you can put them in just about anything, you don’t need any fancy (or expensive) decorative pots, I’ve found some great pieces at thrift shops to put succulents in. 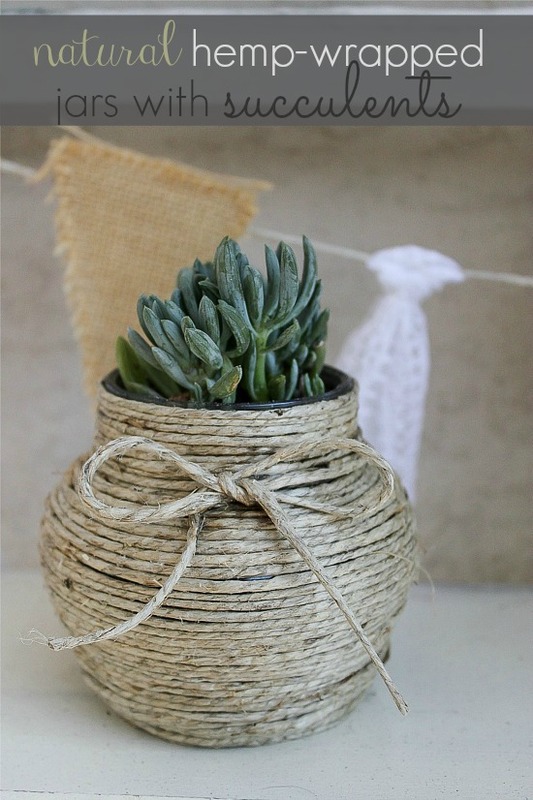 I’m going to show you just how easy it is to make a natural hemp-wrapped jar to place succulents in. Apply a ring of E6000 glue to the lowest edge of the jar. Alternate between adding a ring of glue, and pressing the natural hemp onto the glue, going around and around until you have reached the top of the jar. 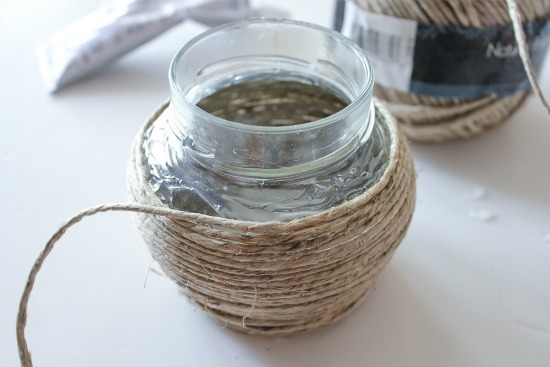 Press the hemp cord down with your fingers so that it covers the jar and there are no large gaps. Cut an extra piece of the natural hemp cord and tie it around the top, making a bow. Secure it in place with the E6000 glue. 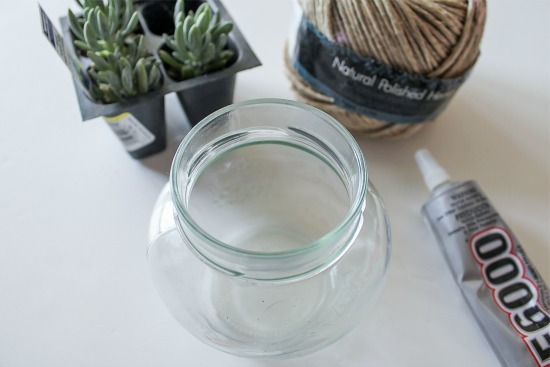 Pop some potting soil into the jar and then your succulents. Because there are no drainage holes you don’t need a lot of water, just add a little every week or so, try keeping a spray bottle handy, this will help you limit the amount of water you add, you don’t want the soil to be really wet. Note: You can place rocks (like aquarium gravel) in the bottom of the jar before adding the soil for drainage, especially if you tend to over-water, but seeing as I barely remember to water I’ve found I don’t need to make that extra purchase. Make a few of these and place them down the center of your dining table for an inexpensive centerpiece instead of purchasing flowers. I love succulents and want to bring some starts from my outside plants inside, I think this would be a prefect way to display them. Thanks for sharing. I love this idea. Do you think this would work with herbs or do I need more drainage for that? I can’t wait to make this one! It is a great green and recycle craft,plus simple and elegant. Also easy and great for gals like me who forget to water! Thank you SO much! I love this idea! Super cute.